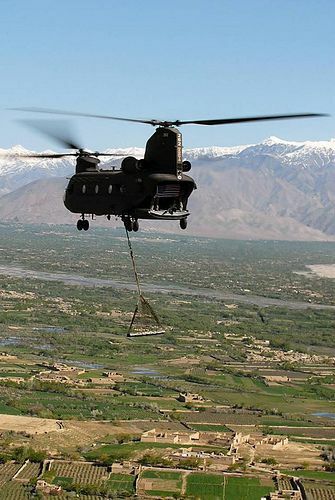 A CH-47 Chinook helicopter flown by aviators from Task Force Falcon carry a sling-loaded I-beam from the World Trade Center and display an American flag above Parwan province, Afghanistan, on March 31. The beam, which is nine-feet long and two-feet wide and weighs more than 950 pounds, was donated to the U.S. military by the residents of Breezy Point, N.Y., through an organization called Sons and Daughters of America, Breezy Point. Photo via the US Army by Sgt. Spencer Case.